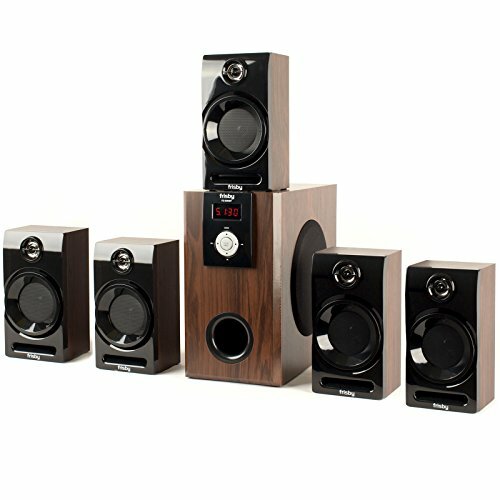 Frisby FS-5060BT Bluetooth 5.1 Speakers provides clear sound from all satellite speakers and woofer from up to 30 feet away. You can sync any Bluetooth enabled device; your phone, tablet, media player or even your computer. The subwoofer features an LCD screen that makes it easy to see which track you're playing or adjust EQ level or volume. Frisby FS-5060BT supports Bluetooth 5.1 technology for streaming audio wireless from devices that are Bluetooth-enabled. For other non-Bluetooth devices, there is a 3.5mm auxiliary input ports. Additional conveniences include an LCD display and included remote control. You've got full power to fill your room with big, balanced sound. Both speakers and the subwoofer are magnetically shielded to provide the protection against image distortion from external electronic sources. Compatible with all PC models, Labtops, smartphones and all mp3 players, IPOD, discmans, walkmans equipped w/ headphone jack. The system is complete, comes with all necessary cables. The included remote control has controls for bass and treble EQ, volume, play/pause, previous/next track, Bluetooth sync and power. The speaker also has an LCD display and volume/sync buttons. Contents: Subwoofer/Amplifier, Center Channel Speaker, 4 Satellite Speakers, Remote Control, Batteries, Spare Fuse, Manual 3 RCA cable, 1 Audio cable...SUBWOOFER Driver Size 5.25 inches, 50 Watt RMS, Dimensions Width: 6.7" Depth: 12.5" Height: 12.2", SATELLITES Driver Size 3 inches, Dimensions Width: 4.6" Depth: 4." Height: 8.7"... WARRANTY : 1 year warranty exchanges for factory defects. Each to connect, search for bluetooth device in your phone and connect and enjoy listening music or audio files wirelessly.